This is quite a story! Derek and I met through online dating. I always say that I internet shopped for him! He was a widower and I was divorced. He had made up his mind to emigrate to New Zealand, then threw caution to the wind, just in case there was anyone out there who might stop him. We both had a list of qualities that we hoped a future partner might have and both thought it wise to leave nothing to chance. We posted at the same time on Friends Reunited Dating Site. I saw Derek’s resume and typed to him “I like your profile”. He was away in Crete and took three weeks to respond. Two weeks after our initial contact we filled our glasses with red wine and talked on the phone. This conversation revealed that we had both done the same geography field study course in West Wales, when we were “A” level students. We decided that, as we had enough in common, we would meet for a night out. Friendship and mutual admiration blossomed and we continued to date over the next few months. One day Derek revealed to me that he realised that he didn’t need to venture to the other side of the world as he had found what he wanted in UK. However his world trip was already booked and so he asked if I could possibly do part of it with him. This involved meeting in Sydney and travelling on to New Zealand for Christmas with his son and family in Kaikoura. 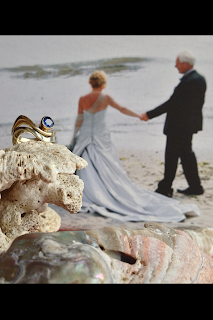 It was a whirlwind romance because after three months, whilst on holiday in Crete he bravely made his proposal to me. I say bravely because he is an accountant and they don’t do things like that, do they?! I was a lingerie designer, so that was even more risqué! This plan all sounded absolutely fabulous to me and I agreed. I flew out to Sydney two months later and Derek met me at the airport with a big smile and a red rose. A week later we arrived in New Zealand and began our adventure. Our tour took in walking part of the Queen Charlotte track and entering Abel Tasman territory via Nelson. We had heard great things about Nelson, like having the best sunshine hours and a very good fish and chip shop, important to us Brits. On the first day in Nelson Derek went to the Tourist Information Office to book the next leg of our journey. He sent me on a mission to find my engagement ring. We agreed to meet later that day. As a designer this was a task I found difficult in a town that I was not familiar with and I must admit that after the first hour I got rather bored. I ventured into the most wonderful textile shop, filled with hand knitted clothes. Time passed and I became engrossed in trying on the various works of art! Forty minutes later I jumped to see the time and frantically made my apologies as I departed saying “I’ve been sent on a mission to choose and engagement ring, not a jumper”. “Have you tried Jens Hansen around the corner?” she asked. “He made the rings for Lord of The Rings”. Following her pointed finger, she may have been a hobbit, I ran off in that direction, already convinced that my mission would be a failure. Now I can tell you that my ring was in your shop. It shone out at me with a “choose me”, just as the right wand chose Harry Potter. 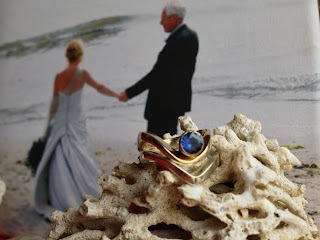 The cornflower blue of the stone set on an asymmetric wave of yellow gold was the perfect combination for a Pisces girl and it fitted like a glass flipper fitted the little mermaid. I returned with Derek who loved it too and had the brilliant idea that we should be fitted for our wedding rings at the same time. We loved the idea of a ring mirroring the same form, but in white gold, emphasising the wave shape beneath the yellow gold engagement ring. Derek’s ring was to be a plain white gold band. We decided that the perfect way to make this official was to celebrate it with Derek’s son, wife and grandchildren before we flew off to North Island. Where better than in Queenstown on New Year’s Eve? When we stepped aboard the Earnslaw steam ship on the lake that evening, the grand kids were unaware that they would soon witness the pianist aboard make an announcement and that their own granddad would get down on one knee amongst a boat load of strangers. When we departed from the boat the fireworks went up in Queenstown and we were marked out by a reporter from the Otago News who asked “Have you guys got a story to tell tonight about why you are here”. I was able to thrust my hand in the direction of the camera. “We’ve got engaged tonight on the other side of our world” I exclaimed with radiant happiness. 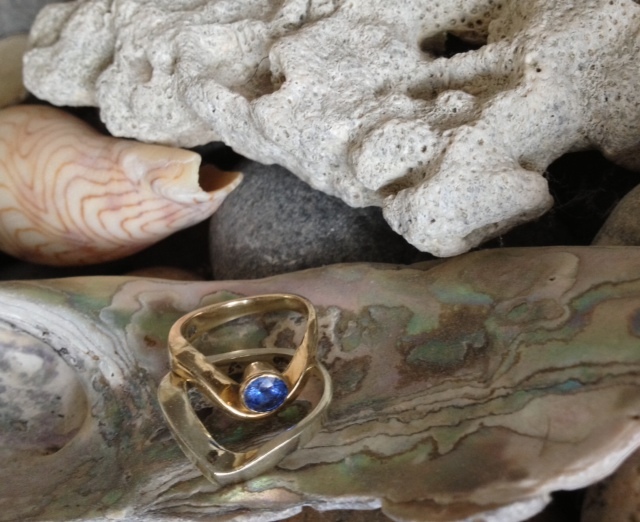 The story of the accountant, the knicker designer and the Jens Hansen rings doesn’t end here. A very funny thing happened. We live in a very perfect part of the UK, in Cornwall overlooking St Michaels Mount and Mounts Bay. Our families are dotted all over the country. It seemed a perfect choice to bring families and friends together on a seaside wedding, as soon as the weather was warm enough. April would be a good time, at the end of the Easter holidays and on a Friday, to avoid the crowds. The 29thwas chosen. As we made our formal announcement of our date to friends and family the BBC News informed the nation that Kate and William were also to be married on that date! With the nation embarking upon a season of frenzied Royal Wedding fever we put in to action our seaside wedding plan. 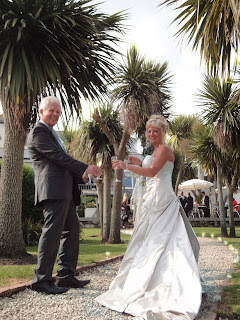 In Penzance our wedding was known as “The Alternative Royal Wedding”. Then another strange thing happened. We searched the county for an appropriate venue for such a royal occasion. Our hearts favoured our nearby Queen Anne home, Trereife House. It looked a little dusty and unloved, with falling plaster facades and frayed textiles within, but its garden was bursting with colour, it had a sea view and it had a grand frontage ideal for vintage busses to bring our guests and for Derek’s brass band to play on the lawn. We booked the date, and then the owner informed us that a TV station had chosen Trereife House for its series “Country House Rescue”. If they worked really hard they could just about get everything restored for our day. Little did we know, until we saw the series televised, it was only just in the nick of time. A few weeks before the 29th April daylight still streamed through the roof and the sun illuminated the rising dust. The wedding rings arrived from New Zealand, Derek’s family arrived safely after experiencing the Christchurch earthquakes. It was a warm spring and all was in place for one very hands on and much planned, virtually royal, wedding. The day before “the big day” Derek finished making the wedding cakes, filling one with raspberry champagne and another with chocolate Grenache. They were decorated by my artistic sons with a sea scene. I went to my local flower shop and gathered up flowers that would complement the theme, lilac, blue sea holly and delphiniums, echoing the blue sapphire of my ring. My son filled hurricane lamps with sea sand, pearls and abalone shells for the table decorations. Night lights and lanterns were set out along the footpath between the palm trees of The Old Coastguard, the reception venue. The “Royal Day” arrived and most BBC cameras were at Westminster Abbey. My BBC cameraman brother was on duty at our far flung corner of the Duchy of Cornwall to film our very own Alternative Royal Wedding. With the timing of Will and Kate’s ceremony being two hours ahead of ours, I joked with the press that if Kate were wearing the same dress as I, then I would still have time to alter mine! The vintage busses arrived at Trereife House, the song La Mere (Beyond the Sea) greeted our guests and gave a taste of the day to come. They took to their seats in the newly refurbished house, the theme of the Italian Job (On Days Like These) struck up. My youngest son played the guitar and sang Here Comes the sun as I came down the aisle with my best men, (my other two sons) and three little flower girls. Derek’s two best men were at his side, our friends did the readings, we made our own vows to each other as we exchanged rings and we exited to Dean Martin’s That’s Amore.. The sun shone, the brass band played our favourite songs and soon the vintage coaches were loaded to whisk us all to the seaside. We arrived at the beach for informal snapshots and sun bathers were surprised to see our wedding guests queuing for ice creams. The majestic St Michaels Mount was silhouetted against a blue sky and sparkling sea. 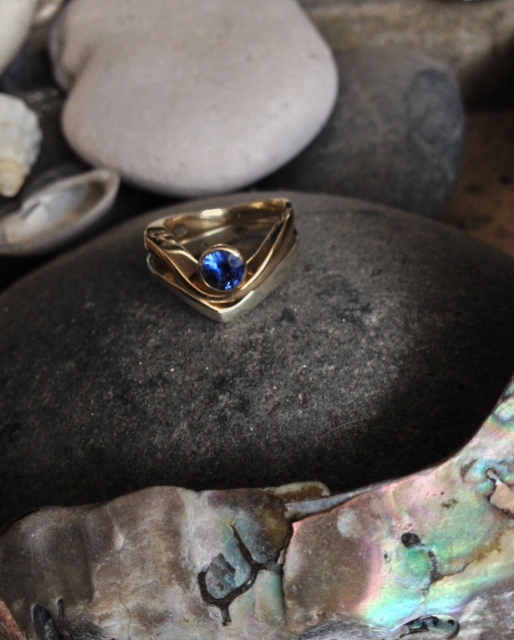 Throughout it all many compliments were made by people about our rings. 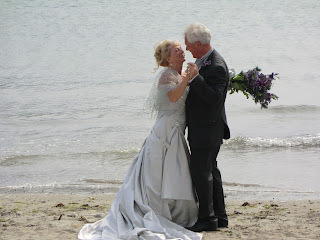 The photographer commented on how the silver teal of the dress resembled the inside of a sea shell and the rings merged like ripples on the shore. We all re-boarded our vintage busses and were whisked away to The Old Coastguard seaside garden. This was our reception venue and a most wonderful time was had by all, right through to the evening, culminating with the setting off of lanterns over the sea. We were in the newspaper because of the date and Friends Reunited got wind that we had met on their site. They wrote an article that was picked up by Woman and Home magazine who then did a feature. Their approach was that fairy tales happen at any age, but I suppose this would also make a wedding magazine feature. I hope that you can find something useful in this tale. It is a bit long, I know, but when you are asked what the story was, I thought that I might as well tell the whole thing so that it is all recorded for posterity. 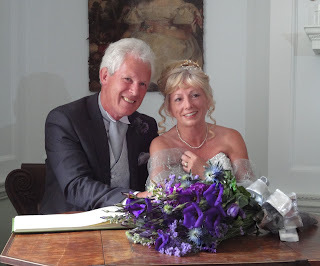 I never thought before about letting you know how it all went, until I came across the Thomas Harrison news item which led me to your Blog and I thought “I’ve got a story too”! It carries on because I made an “Alternative Royal Wedding” group on Facebook and add news to it periodically. I added your link as soon as I found it. We had an anniversary story last year when I wore your silver leaf earrings …….. but that’s another story as they say. So that is pretty much it, kicking open doors, having a vision, being pro-active and having the best choice in men and rings. It all helps to make dreams come true (with of course a little help from a lady in a Nelson textile shop).